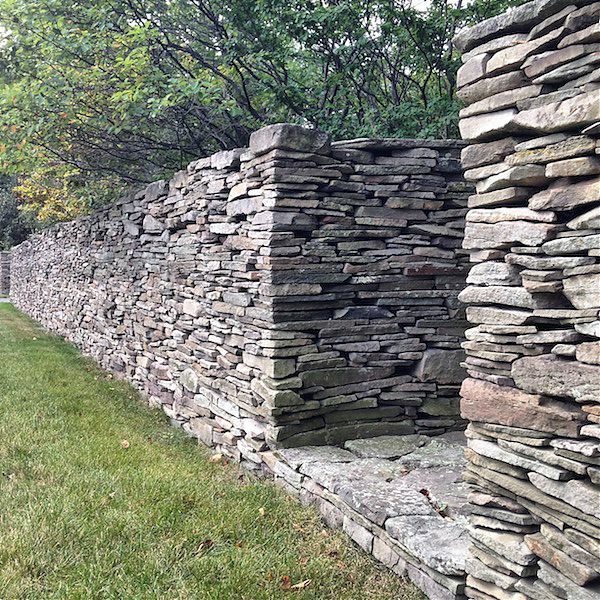 The dry-stacked stone wall outside Peter Bohlin's house in Waverly, PA, photographed August 2014. In 2010, Martin Pederson at Metropolis asked me to write a profile of Peter Bohlin, recipient of the AIA Gold Medal that year. Bohlin, whose now 50-year-old practice Bohlin Cywinski Jackson is responsible for 65 Apple stores and scores of academic buildings, has always had a love of designing houses. To write the profile, I visited Peter’s own house in Waverly, PA, a historic one-room church to which he and his wife Sally have added rooms, art, and many found treasures over the years. When Peter asked me to contribute to BCJ’s new book on their houses, Listening, I said yes, on one condition: that I could write about his own house. This is the essay I wrote for that volume, just published by ORO and Rizzoli, along with some of my photos from my return visit. When making a house, metaphors matter. Is it a gem? A sweater? A piece of pop art? A nostalgia trip? What’s wonderful about Peter Bohlin’s own house in Waverly, Pennsylvania, is that it can be all of the above. That multiplicity allows it to serve as a kind of lab for the firm’s ideas about domestic space. As you move outward from its modestly scaled rooms and into the array of projects in this book, you can see correspondences and callbacks, ideas refined, inflated, intensified. Clients get something new, but at home, there are layers. In Waverly it feels as if the buildings (initially, a nineteenth-century African- American church and cottage) are constantly being let out, rehemmed, reversed and resewn, like a set of infinitely adaptable garments. That softness is not reflected in the materials, which tend to the elemental, or the forms, which tend to the rectilinear, but in an overall attitude toward space as a malleable substance and toward comfort as a reigning principle. Kitchen too dark? Pop out a wall. Grandchildren? Stretch out a transparent bridge. Scenery for the dining room? 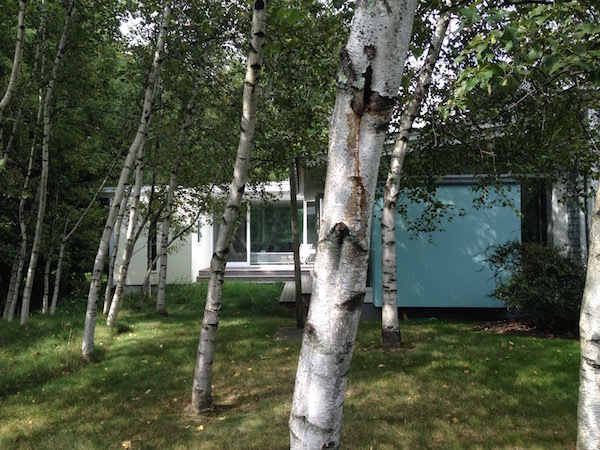 Plant a stand of birches. Each change works not from the point of view of the architect reading plans but from that of the architect sitting in a dining chair, or his wife sitting at her desk, or their guests eating lunch picked from the garden out back. Here, no one is trying to stuff life into a glass box—that’s for Apple. 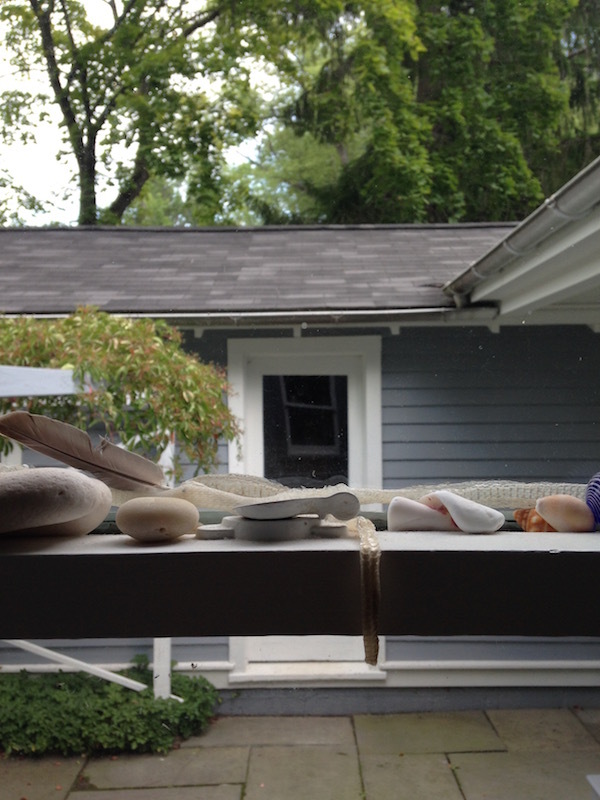 At home, the windowsills accumulate collections of rocks and shells and a vitrine, topped with a stuffed bird, turns out to be a cabinet of curiosities by artist Josiah McElheny. The compound (house, guesthouse, poolhouse, and pond) is hidden behind an impressive dry-stacked stone wall, native to the countryside. That wall serves as a datum, a straight line from which all else meanders away. The garden melts into a field of grass and wildflowers. The pond disappears into the bushes. The buildings separate to offer views, helpfully extending decks (more like docks) across lawn and water. You’ll notice, throughout this book, the firm’s preference for an entrance you see through to the other side, and for decks, walkways, and bridges to carry you from place to place. The Bohlins’ bedroom is in a little cinder block pavilion, painted gray so you hardly notice its humble material, made larger by a pair of French doors and one of those decks. Bohlin may insist that you lie down to better appreciate the particular combination of sky, field, and cloud he has arranged as his alarm clock. There are also colors. The pool has an azure bottom, the poolhouse stacks and stacks of blue towels. The closet that pops from one side of the dining room is lime. The stucco is lemon. The Eames rocker is sunflower. The radiators, carpet, and upholstery are white, but the cushions are a winding pattern of vines by Josef Frank. A yellow Amish scooter bike leans against the gray house. These are storybook hues, picked to mark the edges between building and landscape, enclosure and object. 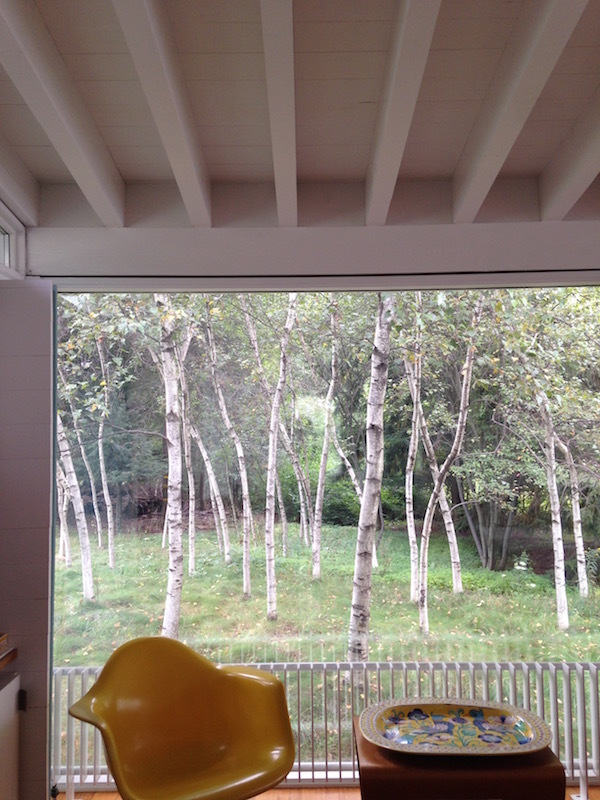 Some of BCJ’s houses let the landscape dominate, with big windows and interiors in wood and stone. But I like the buildings that keep the toylike quality found in Waverly: the crimson and forest Erector Set-like House in the Shawangunks, the apple green walkway to the Skyline house, the cadet blue façade at Goosewing Farm. The simple surfaces command attention, act as signs of activity, of interruption. The spaces of contemplation are more neutral, like the stone-faced fireplaces that appear in almost every building. It’s easier to create such softness in an old house. They have their quirks and peculiarities, and if you are a smart designer, your first move is not to iron those out but to build upon them (Bohlin likes to call this “circumstance”). New houses and big houses are more difficult because one has to build in peculiarity. It can come from the site, as in Bohlin’s 1975 Forest House (fig 12), which, despite its boxy form, rakes its windows over to the south to admit maximum sun while remaining embedded in the forest. Newer houses make the same move with more graceful curves, as in the Whistler Residence, where rooms spin off an interior arc. In that case, the clients’ children insisted on a cricket lawn, so the center of the house is a green-floored outdoor room, as unusual in a mountain setting as an equivalent-size oval ballroom would have been. The economical Skyline house in Bend, Oregon also owes something to the Forest House, with its dark cladding and lantern-like windows. 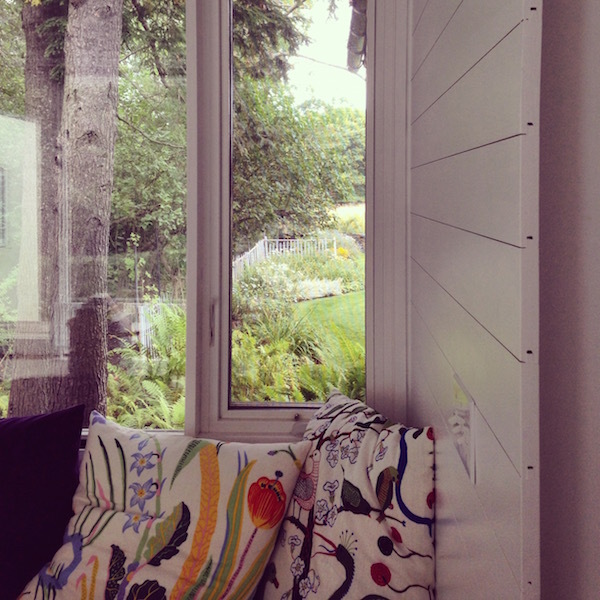 At one end of the long, narrow box, there’s a tiny cant, a bay popped out to give its owners, like the Bohlins, a better view from the master bedroom. Because of the clients’ budget, the firm couldn’t string the rooms along an outside path, as at the Combs Point House (fig 13) on Seneca Lake, New York. The idea of a long, flexible spine can be more explicit or more latent from house to house, but it is always there, making sure you don’t get lost. At Goosewing Farm in Rhode Island, the firm did have historic architecture to work with: a clapboard Cape, stripped down and given a long-lost fraternal twin. In the old house, sitting and sleeping, in the new, domestic industry in the form of kitchen and baths. But BCJ would never make something new just like the old. On their Cape the clapboard is cut away at one end of the house to make an almost-modernist glass breakfast room. They also push out the short end of the house, changing up the view with a horizontal, landscape-framing strip of glass caught between planes of blue siding. The paired houses make a tiny compound within the farm’s larger collection of buildings, their rooms designed (as at Bohlin’s house) for specific kinds of sociability. The firm’s addition of a poured concrete watering trough (fig 14) at the invisible crossing between the farm’s main house and the enclosed walkway between the twinned Capes might seem like a bit of architectural hubris, a mark too faint to be read except in plan. But the trough serves a purpose, helping the visitor to understand that the whole experience—cows, lichen, meandering stone walls, water—is part of a plan. The spine returns as a metaphor, an imagined line stretching across the grass. Such lines hold together the bundle of contradictory desires and emotions clients bring to making a house, and to which architects must respond with inventiveness and restraint. Even when they are their own client.